Every company and organization require recruitment of new employees from time to time. Some companies do it annually while others do it when there is a demand for it. In all such situations, Job Application form is mandatory as the candidates apply for the advertised vacant post through it and it acts as a record for future and a summary of their resumes. 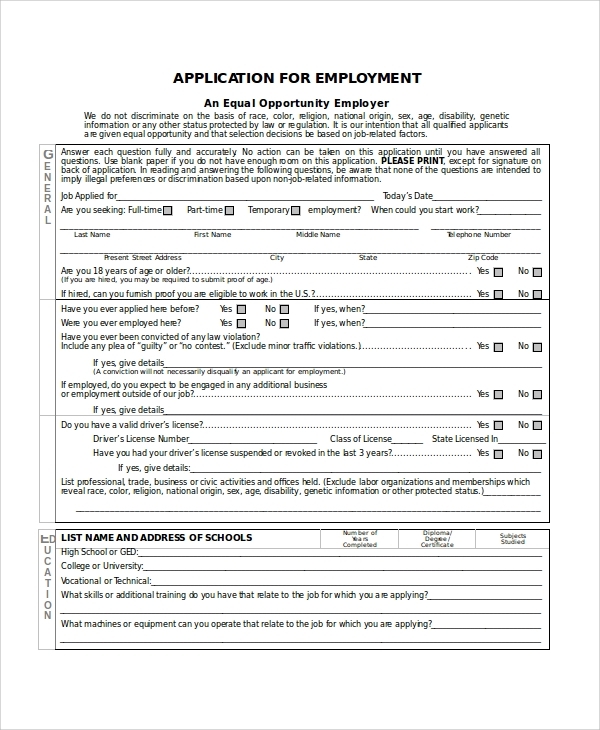 The following employment application forms have the perfect format for different categories of employment. 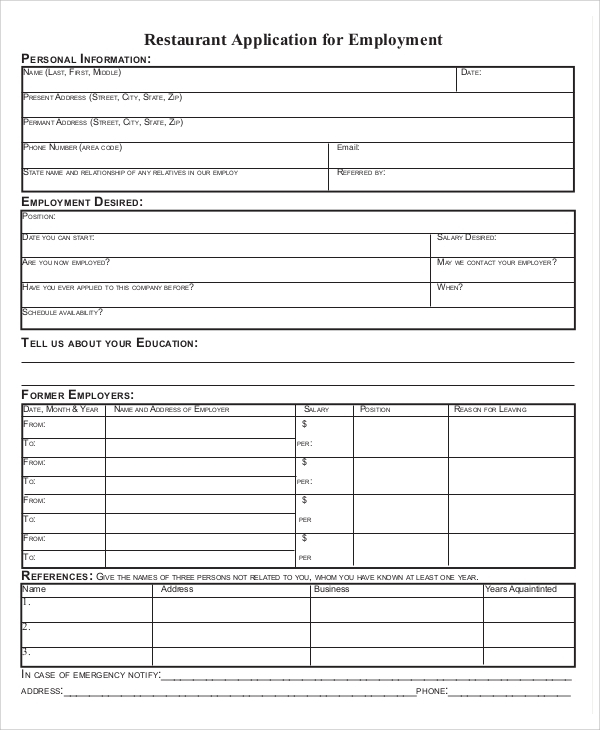 This is an Employment Application Form for the construction companies. It contains fields for personal data, position data, employment history, educational background, references, skills and competencies, and declarations. 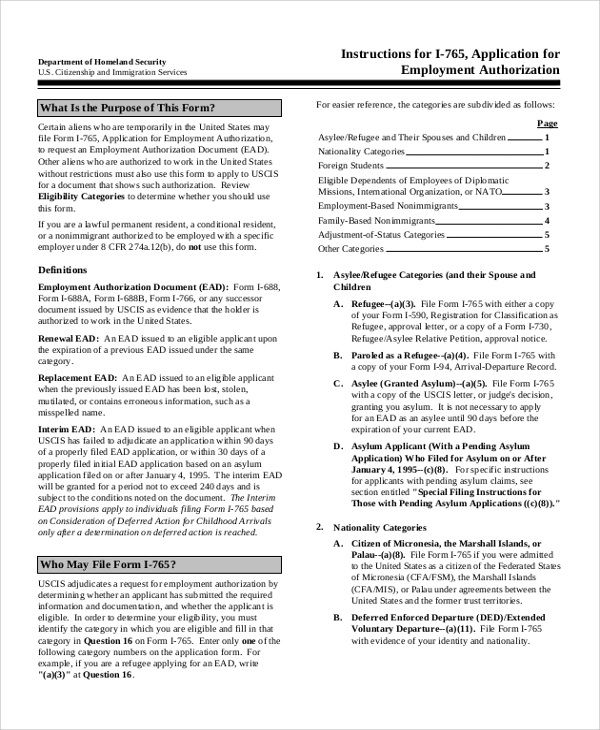 Application for Employment authorization is required when an immigrant wants to work in the country where he or she is staying right now. Since he or she is not the citizen of the country, he or she needs to file an application. This document acts as a guide for them as it states the forms that they must fill and necessary instructions to fill them. 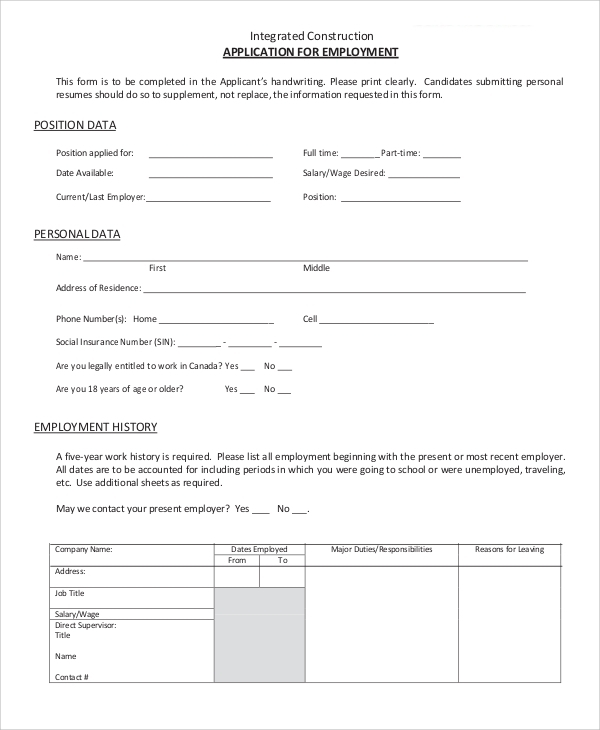 This is a temporary employment application which a willing person can fill and send via courier to the company to apply for the post advertised. It has regular formats such as employee information, employment history, education details, skills, personal data and others. 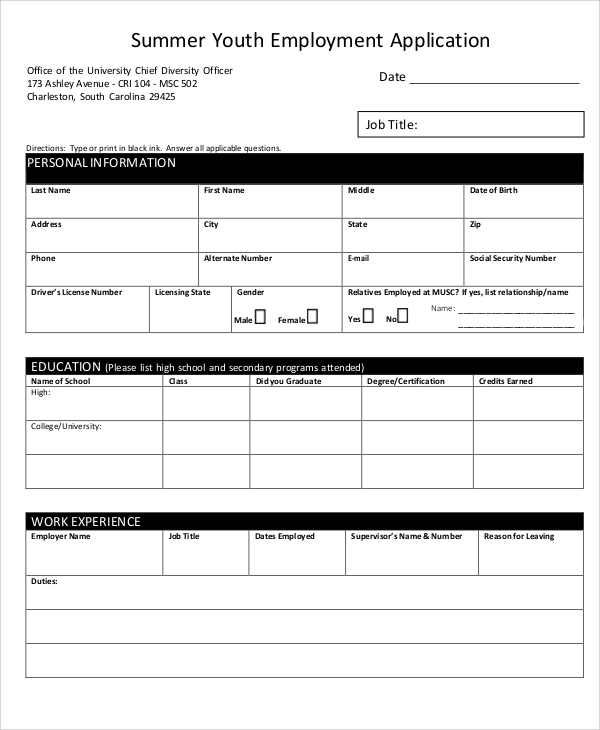 Employment application forms are mandatory for any company or organization to recruit people in different positions. 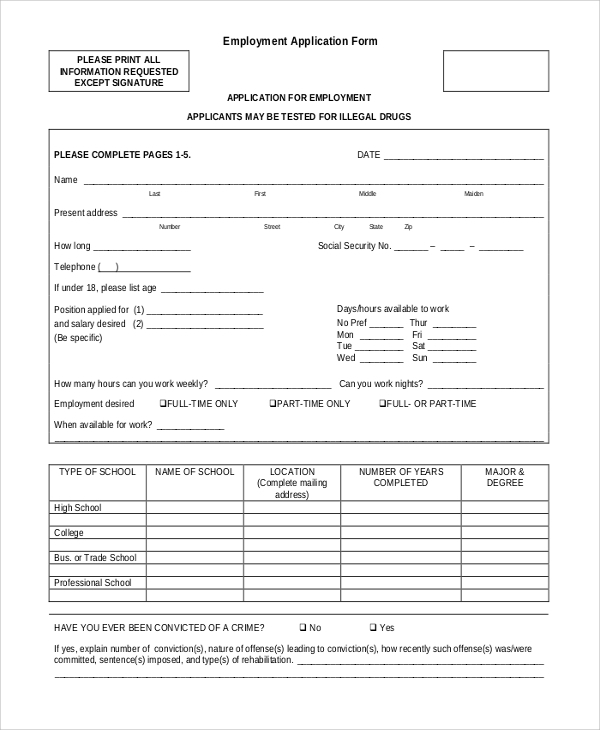 Application Forms are released by the company to let interested people apply for the job and get desired information so that among all the applications, they can find the best ones and give them a call for an interview. 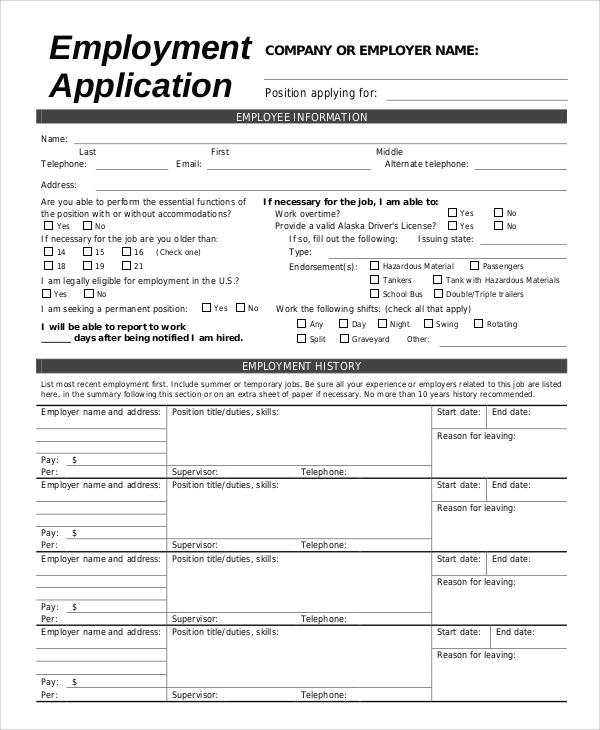 The above-listed application forms have a readymade format which will help to release application forms faster just by making a few modifications. This is an internship or temporary job offering for youth who are free in the summer to work and gain experience. 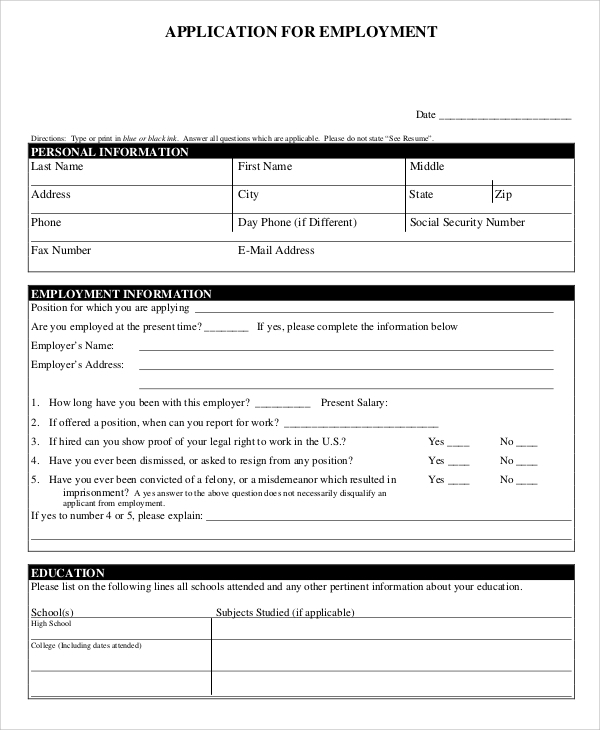 This is a readymade Employment Application Form with proper format for any company willing to make the offerings to the students and fresh graduates. 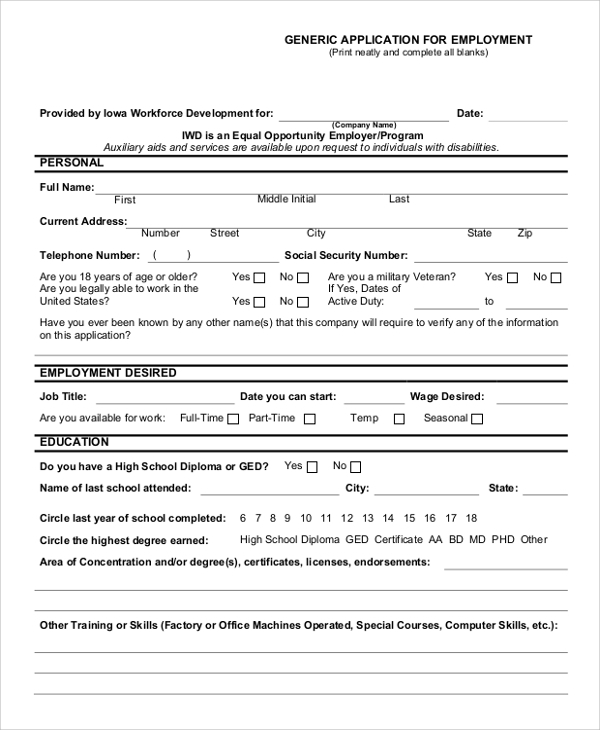 This is a perfect application form for restaurant employment. It is very simple and basic with personal information, employment desired, former employers, terms and conditions of the job description and other declarations and statements. The targeted audiences for such employment application forms are the companies willing to recruit people at any time in the future. It is also useful for hotels, restaurants, airlines, and all other industries, in general, to target the right people to hire. Similarly, immigrants require them to get their authorization to apply for jobs. Internship program organizers also need them to hire students and willing graduates. Even the governmental organizations require them to hire suitable candidates for vacant posts. The above-mentioned Sample Employment Application Forms are tailor-made to get all the required information from the candidates so that employers can judge the best among them and give them a call for an interview. They have the perfect format, and they are all editable and can be presented as per the requirements.